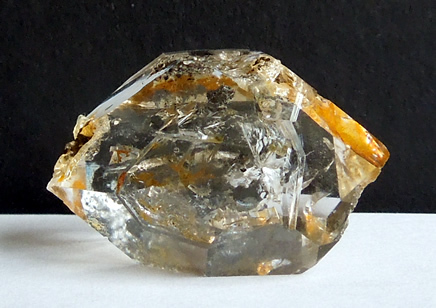 A stunning and large natural Herkimer golden healer crystal. 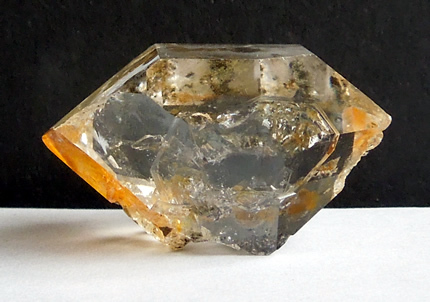 There is much going on with this quartz crystal both inside and out. Externally more than half of the facets (faces) are clean and smooth. One termination tip is sharp and complete with a healed fracture. Iron oxide is sealed inside here. Iron oxide is also present as a coating, giving it a fairly dark golden look. The other tip is there, but bungled. Hopper growth marks cover a few of the facets. Some matrix is present as well and is clearly seen in the pictures. 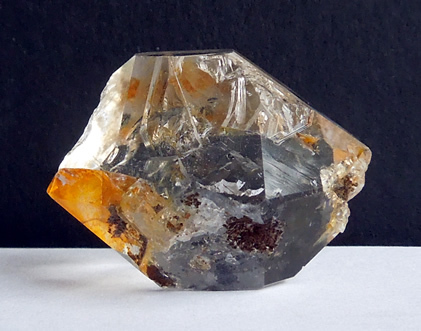 Internally clear inclusions and a piece of black hydrocarbon are engaging. A flat fingerprint-like inclusion strikes a solid color veil. 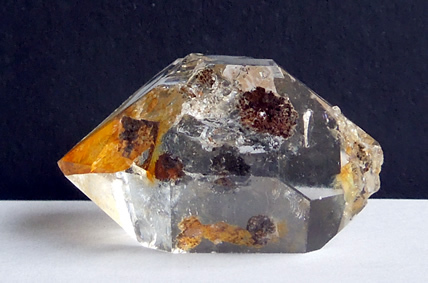 Healed fractures and inclusions occurred during the crystal's formation. Something caused a crack, or hesitation in growth. As the crystal continued to grow, the fracture or inclusion was encased within the gem stone, thus 'healing' it. Those interested in the metaphysical consider them powerful healers because of their ability to have healed themselves. I have also seen these called "self-healed crystals". 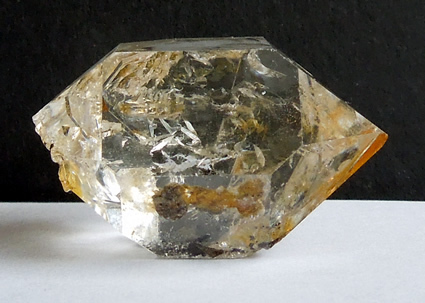 Given all that is going on with this Herkimer Diamond, clarity is great! A fascinating natural specimen. The pictures depict it well. 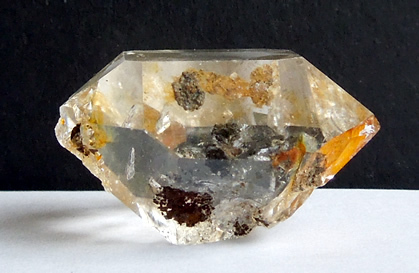 Large and fascinating Herkimer golden healer crystal.